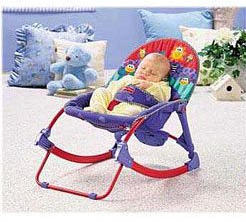 The successful Infant to Toddler Soothing Rocker now features a detachable toybar for baby's entertainment. The toybar features three detachable soft toys (rattle, squeaker, crinkle) and stores behind the seat. Buy 1 for $46.99Buy 2 / Save $2.51!Buy 3 / Save $9.40!